Orofino`s Leading Fishing and Hunting Resort! Orofino: so much to do and see! 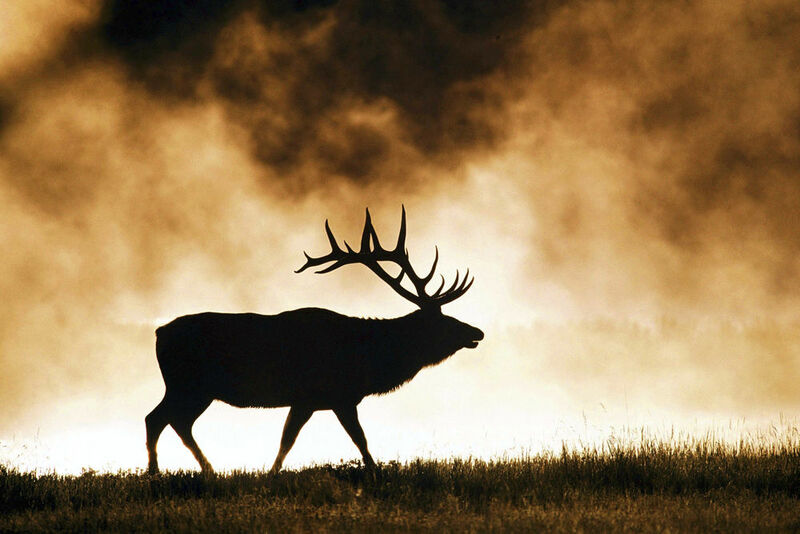 Click on our News Page for Updated Fishing and Hunting News! Click here to check out our Fishing Guide Service! Step into Orofino's friendly, small town atmosphere where people regularly say "Hi", even if they don't know you. The Riverside Motel is a short drive from Orofino's shopping, restaurants, parks, movie theatre, library, museum, and so much more! Come enjoy our town! The Riverside Motel welcomes you to the beautiful Clearwater River Valley. Our facility is located conveniently on U.S. Highway 12, an All American Road. Orofino, Idaho is the gateway to a wealth of activities for a wide variety of interests. Welcome to the Clearwater River Canyon! Riverside Motel welcomes you to the beautiful Clearwater River Valley. Our facility is located conveniently on U.S. Highway 12, an All American Road. Orofino, Idaho is the gateway to a wealth of activities for a wide variety of interests. Whether you are coming to fish for the mighty steelhead or salmon in the Clearwater River, retrace the Lewis & Clark Trail, water ski on Dworshak Reservoir or just passing through on the beautiful scenic byway, the Riverside Motel is your place for a restful, comfortable sleep. We offer you a home away from home while you enjoy the all that this area has, in both indoor and outdoor activities. Where else can you walk across the road to watch mighty B-Run steelhead roll as they return to their spawning ground, see deer grazing on the lawn and maybe even watch a majestic bald eagle as they glide down to catch fish. 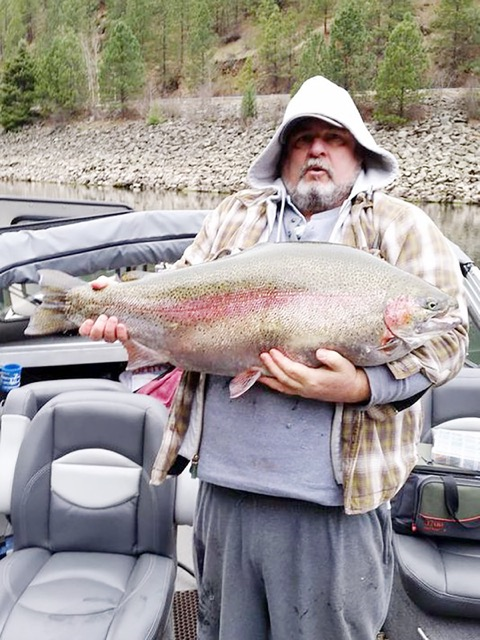 On January 8 an angler and his friend fishing the North Fork Clearwater River landed a rainbow trout that would easily be a new state record, but they couldn’t legally keep it. That’s because any rainbow trout longer than 20 inches with an intact adipose fin is legally considered a steelhead and must be released if caught in waters where steelhead might be found. Wild steelhead (ocean going cousins of rainbow trout) are protected under the endangered species act. Hatchery steelhead are marked by removing the adipose fin. In order to ensure wild steelhead are protected in Idaho waters, Fish and Game requires all rainbow trout longer than 20 inches be released unharmed in waters where wild steelhead naturally return. Some people might think it is unfortunate that the fish had to be released but it is important to remember that this fish might not have ever reached such a size if not for the very rule that required its release. 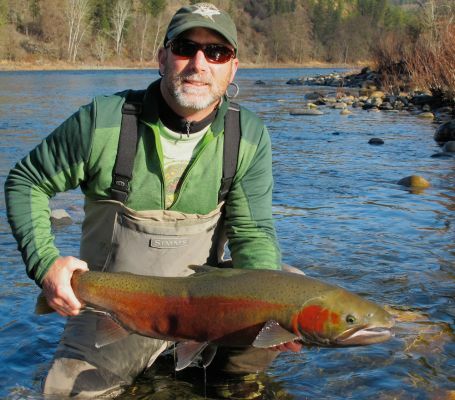 Fish and Game sees photos of giant rainbows landed on steelhead streams from time to time, and anecdotal information suggests these fish are caught more often than some might think. Once a rainbow trout reaches 20 inches in waters that might contain wild steelhead, it receives protection that rainbows in other waters don’t share. (Since 2010, all trout in the Clearwater and North Fork Clearwater were excluded from harvest to protect adult and juvenile steelhead.) So even though this fish was likely released as a sterile ten inch rainbow trout intended for harvest around seven years ago, it has received the same protection as wild rainbows in catch-and-release only waters like the upper Henry’s Fork. If not for that protection, it is unlikely those fish would survive long enough to attain that size. Additionally, fish living below dams like Dworshak have access to some pretty easy food coming out of the dam’s turbines.